Welcome to my personal collection of Cox model engines! Choose a engine size below or from the sidebar to your left! Need Parts? Buy Them Here! 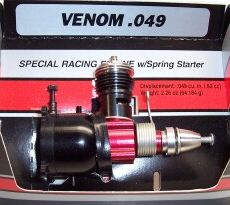 Cox Venom .049 Manual Now Available For Download! Thanks to Bernie from Cox International, a scan from an original Cox Venom manual is now available to download on the Instruction Sheets Page! Killer Bee Cranks "Click on the image above"
from either being told, read on another site/book or was discovered myself. then you will want to check out Martin Hepperle's Virtual Cox Museum. ©2009-2018 Cox Engine Collection. All Rights Reserved.